The status yellow warning kicked in last night for Connacht, Kilkenny, Donegal, Clare, Limerick, Tipperary, Waterford, Cork and Kerry. 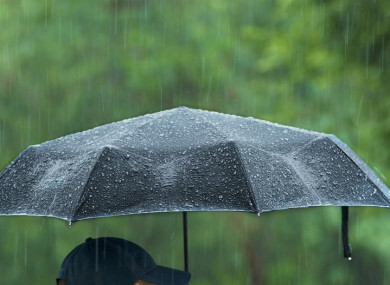 A RAINFALL WARNING is in place for counties across Ireland this morning. The warning is in place from 9pm last night until 9pm tonight, with rainfall accumulations of 30mm and 50mm expected over this period. This morning has started dull and damp as the rain which began in the west last night spreads out over the east of the country. It will turn persistent and heavy at times as the day progresses and there is a risk of localised spot flooding. The rain will ease up across Munster and west Connacht later on, with some bright spells developing by the evening. It will also be cooler than recent days with temperatures between 14 and 15 degrees, in fresh and gusty winds. Tonight will be mostly dry with mist and fog patches. Lowest temperatures of six to 10 degrees in light breezes are expected. Tomorrow is set to be dry and fine to begin, however cloud will later develop with some rain expected. Email “Rainfall warning in place across the country with risk of flooding ”. Feedback on “Rainfall warning in place across the country with risk of flooding ”.